This baby is a must for every performing musician. 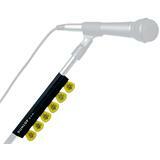 It is made of high quality rubber to ensure a firm hold against a standard mic stand. 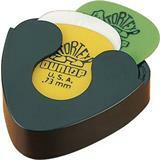 Never loose a pick again! Spring Loaded sleek black design keeps picks accessible during performance. Adhesive backed for easy mounting.